The first time I got to drive in the latest generation Ford Focus RS, it was with none other than Ben Collins behind the wheel. I knew that there was no way I could drive as well as the former Stig, so instead of heading to the track, I spent my week with the Focus RS actually living with the car, to see if something that can be so bonkers on the track could also be a car you could daily drive. 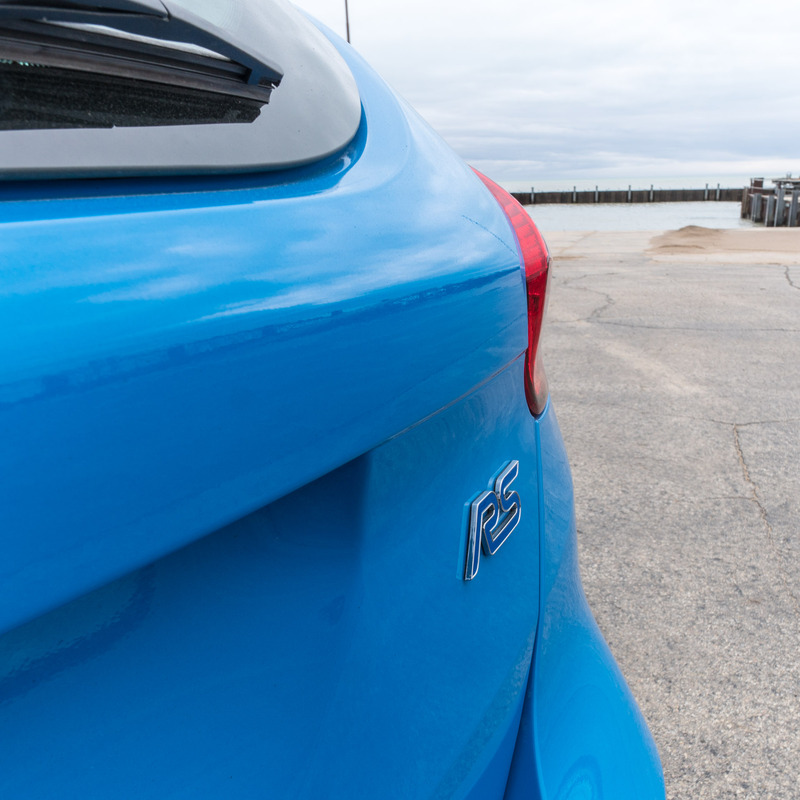 The Focus RS is one of those very special cars you need to drive to really understand. Sure, it’s got some cosmetic upgrades over the everyday Focus hatchback, but beyond the opened up grille, and front and rear spoilers, the average Joe on the street has no idea how much of a monster this little car is. To say that that a car done up in “Nitrous Blue” paint was a sleeper would be a misnomer, but it’s definitely not a showy as some sports cars. If you bought one in grey, white, or black, it would be positively stealthy. 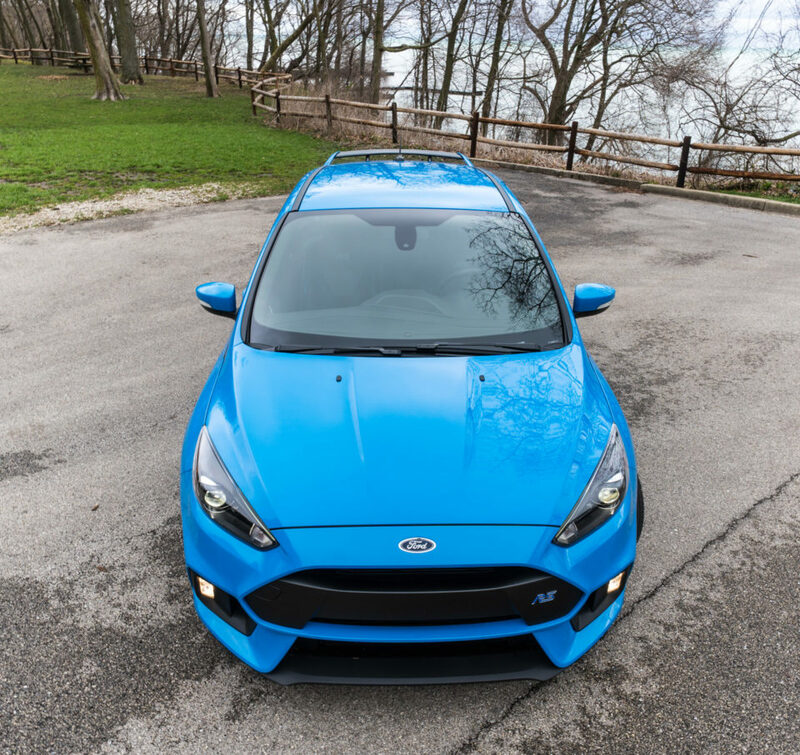 Burbling beneath the hood of the Focus RS is a hot-rodded version of Ford’s 2.3-liter EcoBoost inline-4, which pushes out 350 horsepower and 350 lb-ft. of torque. 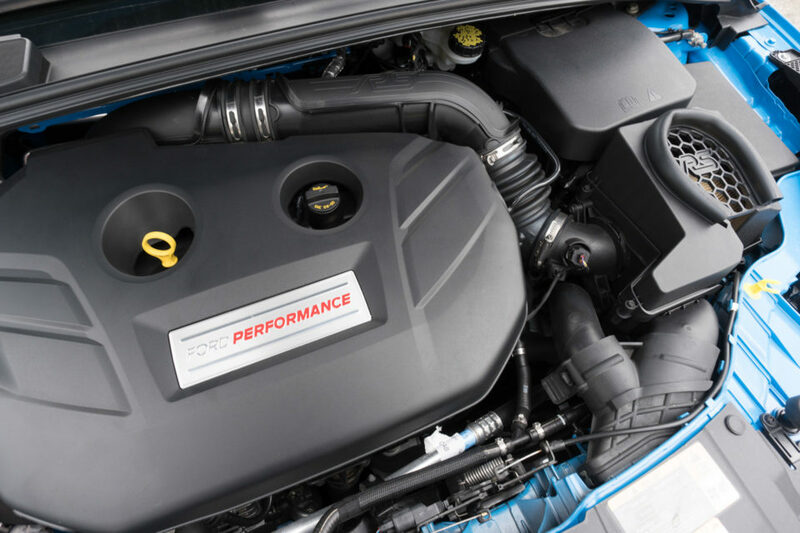 The same core engine only makes 310 hp in the Mustang EcoBoost, and just 280 hp in the Ford Explorer, so Ford Performance really worked some magic to push it to this extreme. 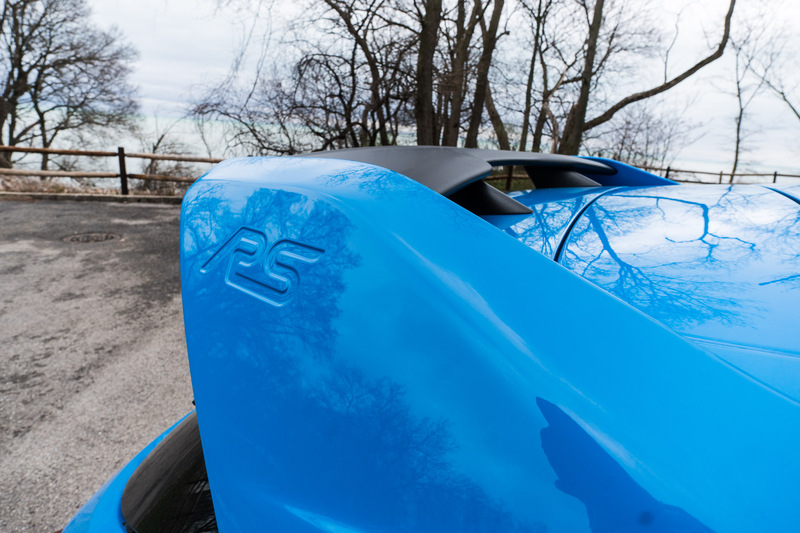 With launch control enabled, the RS can zoom from 0 to 60 mph in just about 4.5 seconds. Its sport-tuned dual exhaust system roars like a wildcat as it ramps up, and if you treat it just right, it might bellow forth a few snaps, crackles, and pops. I found that it makes the happiest sounds between 3000 and 4000 RPM, which makes sense as the RS hits peak torque at 3200 revs. 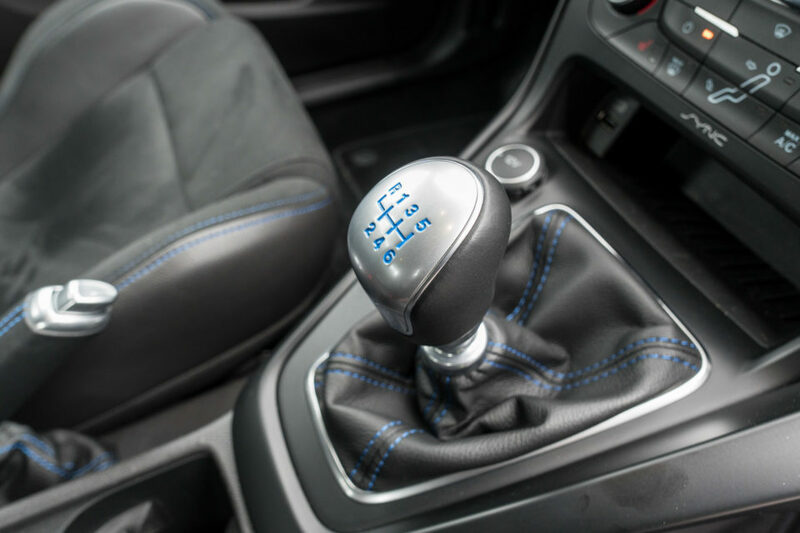 The 6-speed manual is easy to handle, though with all that torque, it really wants to pull on you as you come off the clutch, making it more challenging than some cars in stop/start traffic or when parallel parking. All that power heads to a custom-engineered twin-clutch all-wheel drive system from GKN Automotive, which does a great job balancing torque between front and rear wheels. It’s capable not only of sending up to 100% of power to the rear wheels as needed, but it can dynamically adapt the speed of the inside wheel to help it turn on a dime. This is superior to brake-based torque vectoring systems, which can slow you down as you corner. Speaking of brakes, the Brembos on the Focus RS are sharp and predictable, something you definitely want with a car that can hit a top speed of 165 mph. On twisty turny roads, the German-built Focus RS is as adept as they come, taking each corner like a go kart on steroids, and with none of the understeer found in the Focus’ more basic front-wheel drive brethren. The steering provides great feedback, and the car stays reasonably flat while cornering. While they’re not fully adaptive, the Tenneco dual-mode dampers work well on the street or on the track. In normal mode, they soak up bumps nicely while still feeling agile. In sport mode, they’re distinctly firmer, which makes for more precise control, but will also rattle your teeth on bumpy roads. 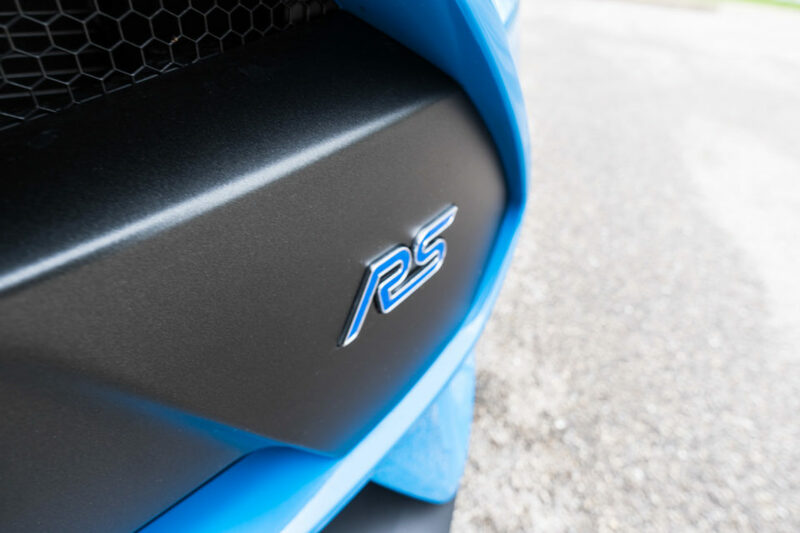 Much has been made about the Focus RS’ drift mode, which is designed to make it easier for amateur drivers to get their drift on, an especially tricky feat in an all-wheel drive car like the RS. I found myself an empty parking lot and quickly found out that it works as promised. Basically, what it does is use the torque vectoring system to send up to 100% of rear-wheel power to a single wheel, predictably tossing the car into oversteer. The stability control nannies keep watch over things to help keep you in control as you drift, but this is definitely a feature that’s best left for a controlled environment. 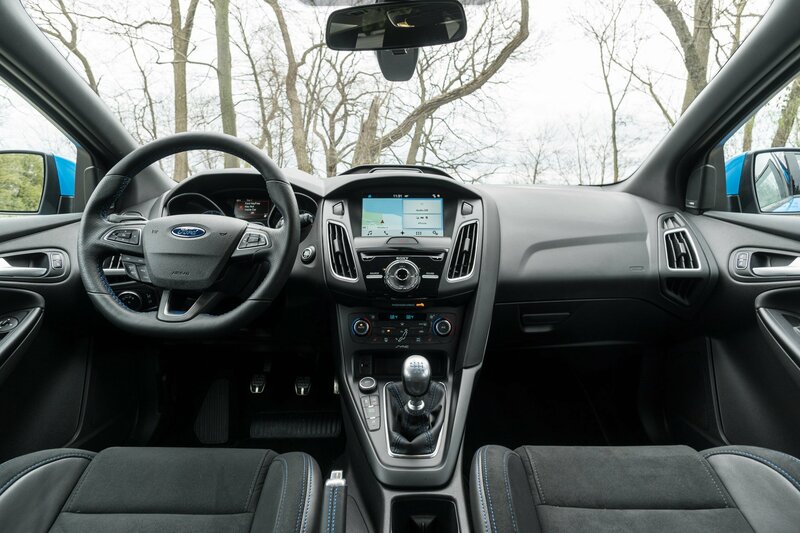 The interior of the Focus RS is primarily concerned with improving the driving experience. 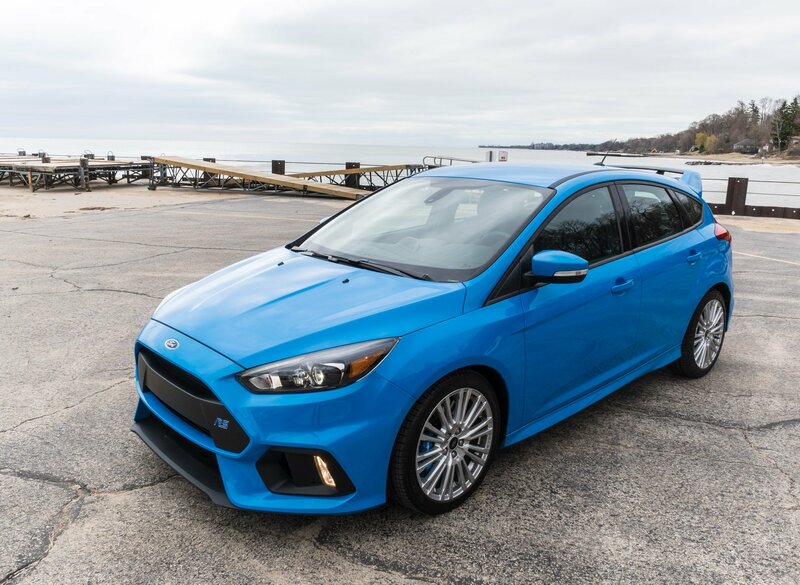 Of particular note are the custom RS Recaro sport seats, which offer deep side bolsters to keep you and the front seat passenger from rocking side to side. Microsuede surfaces help you from sliding out of the seats too. While these seats are extremely good for hard cornering, I did find the bolster width to be a little confining for long drives. 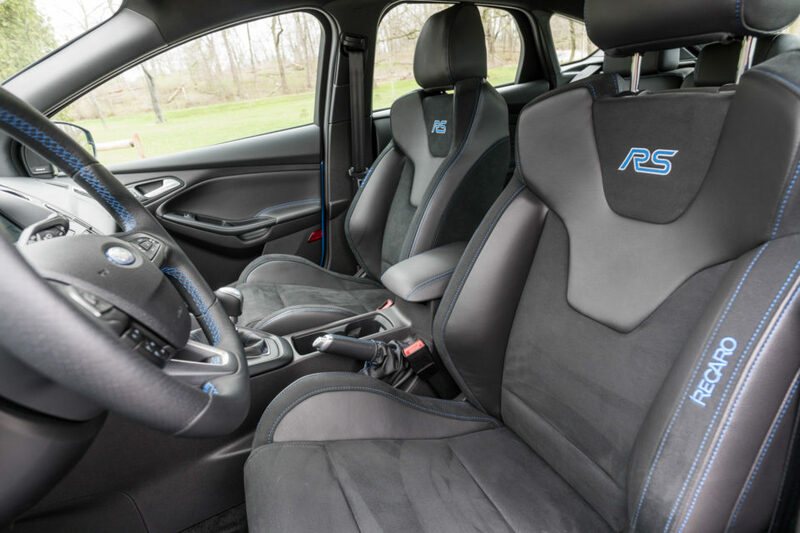 Beyond the seats and some matching blue stitching on the steering wheel, shift lever and E-brake boots, the interior of the Focus RS is pretty basic. Other than the cluster of gauges for oil temperature, turbo boost, and oil pressure, it’s pretty much the same dashboard you’ll find in every Focus model. 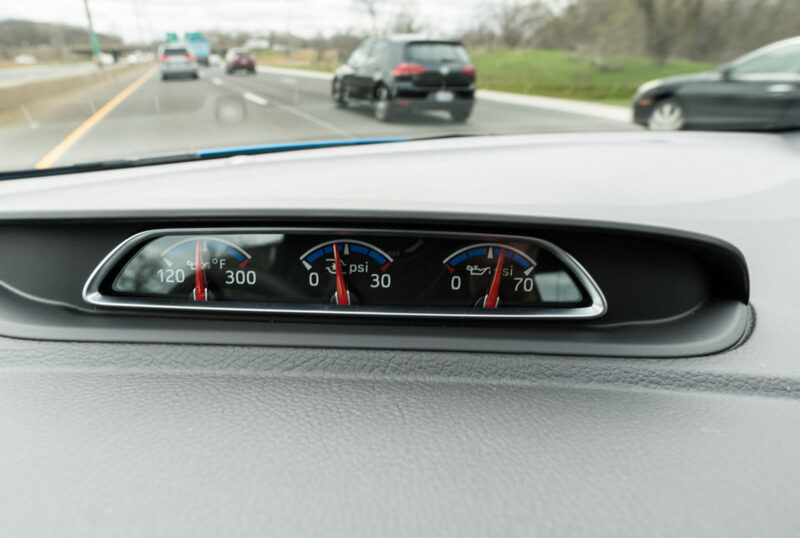 The dashboard has some soft touch surfaces, but it’s not exactly fancy or streamlined. 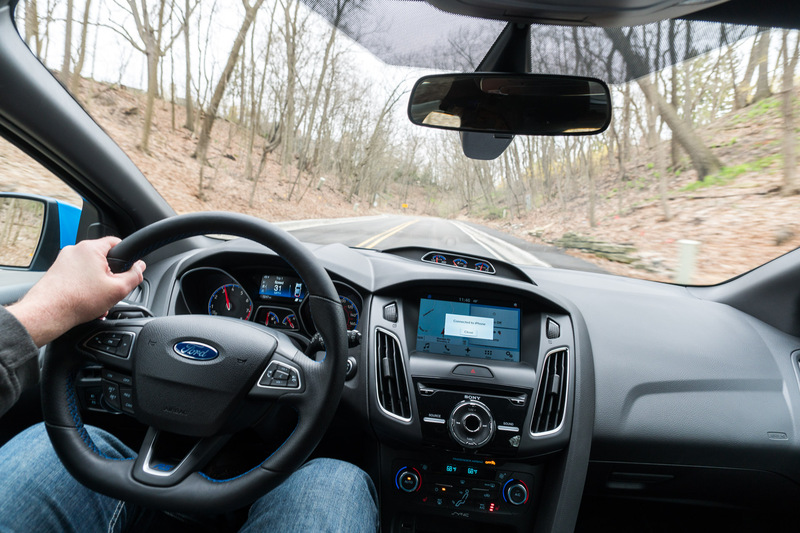 Despite the potential for overuse of the material, I would have liked to have seen Ford sneak in even a little bit of carbon fiber trim to make the dash look more performance oriented. I am glad that the full version of Ford’s excellent Sync 3 infotainment is standard, as is a 10-speaker Sony sound system. Of course, this probably isn’t a car you’re choosing for its interior styling. The Focus RS is about power and handling, and on that it delivers like no other hatchback I’ve ever driven. 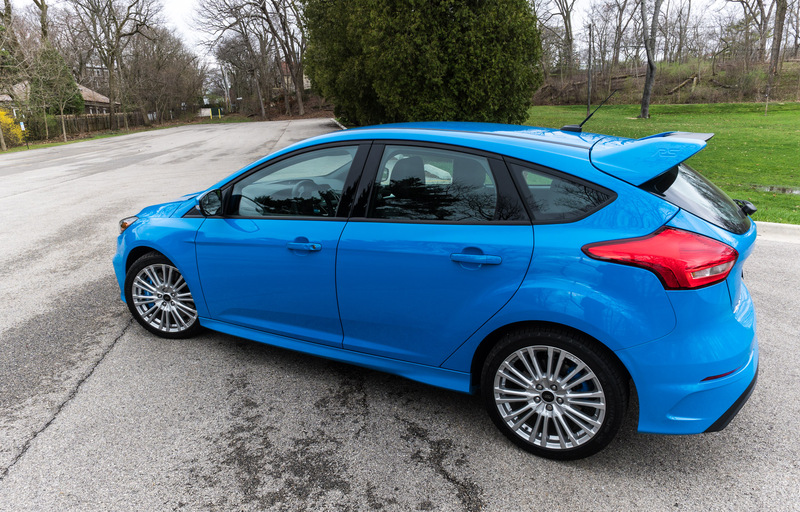 And yes, it’s still completely useful as a daily driver, though it does have a little less cargo space behind the second row at 19.9 cubic feet vs. 23.8 in the Focus ST. That said, with the split-folding rear seats down, you still get an ample 43.8 cubic feet of cargo capacity. Its definitely more raucous than any other Focus, and if you don’t like cars that make loud noises when you step on the accelerator, then the RS might not be as livable for you. For gearheads like me, it’s something I’d happily live with. Another bonus you get with the Focus RS that you don’t get with many sports cars is its ability to handle cold, wintry conditions. Its all-wheel drivetrain provides all of the traction-enhancing benefits you’d expect, and Ford even offers a winter tire and wheel package for those who spend a good chunk of the colder months dealing with snow and ice. Now I want to get the RS back next winter and try drift mode on a frozen lake. 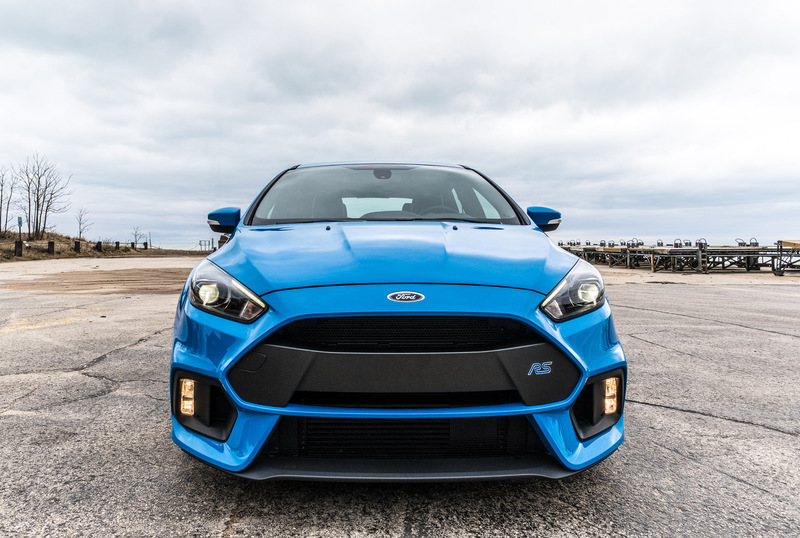 There’s no question that the Focus RS lives up to all the hype that preceded its release last year, and it can proudly stand alongside its other Ford Performance brethren, the Shelby GT350 and the Raptor, while still being more than happy to take you to pick up groceries.